"Breaking news: there are Veterans among us!" When my friend Sean posted that on Facebook this morning, I was immediately reminded that every November 11 in the U.S. is Veterans Day. The holiday honors people who have served in the armed forces, and is not to be mistaken with Memorial Day, a day to remember those who died while serving. 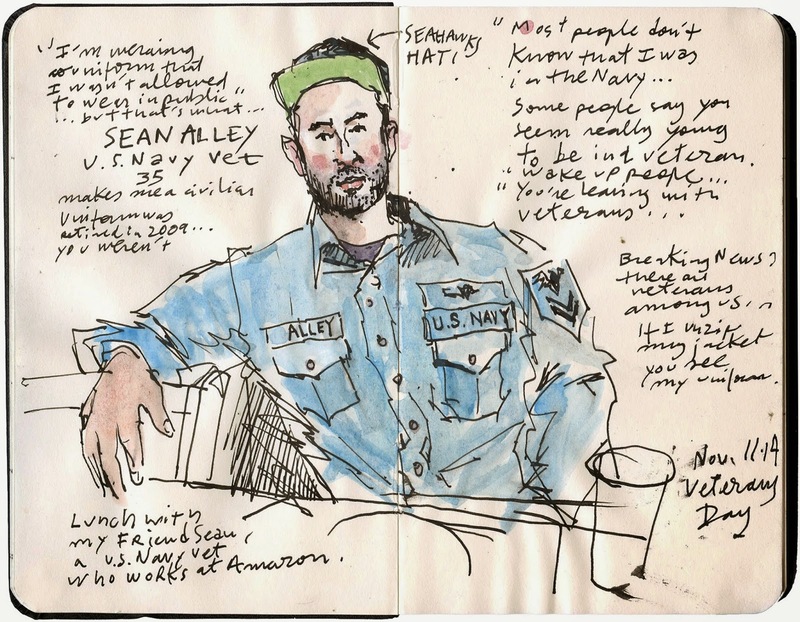 Sean, who is 35, served in the U.S. Navy in his mid twenties. He was stationed in Norfolk, Va., and got to see a few ports, from Montenegro to Dubai and other places in between, while deployed on the USS Anzio, a guided-missile cruiser. Since he works at Amazon just a block away from The Seattle Times, we met for lunch to make the day feel a bit more special (Did I say this is still a working holiday for most people?) Sean was wearing one of his old U.S. Navy blue shirts and I took the opportunity to do a sketch. I think it helps illustrate his own message: Here's a real veteran among us.